Product #205 | SKU 1440-004-110 | 0.0 (no ratings yet) Thanks for your rating! 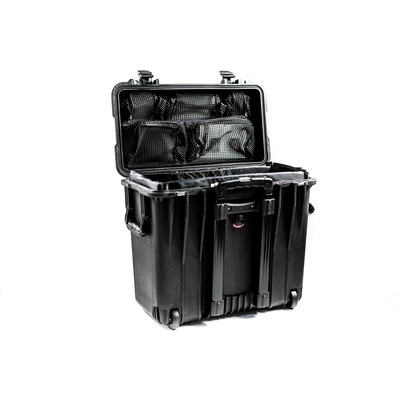 The Pelican 1444 Top Loader 1440 Case with Utility Divider (Black) is an unbreakable, watertight, airtight, dustproof, chemical-resistant and corrosion-proof hard case used to carry any kind of equipment that needs to be protected from the elements. It is made of Ultra-high Impact structural copolymer that makes it extremely strong and durable. It has a 0.25" (6.4mm) neoprene o-ring, double throw ABS latches that seal perfectly and includes pressure equalization valve for quick equalization after changes in atmospheric pressure. The case has a steel reinforced lock hasp protector and is carried by a fold down handle, retractable handle and two built-in polyurethane wheels.